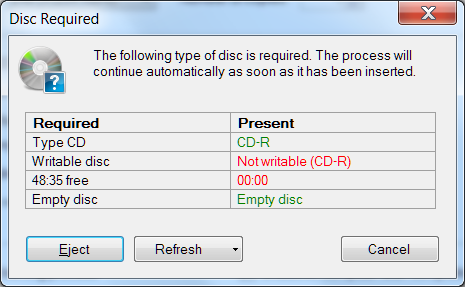 If I try to open the disc, there's nothing on it. So I don't understand what CDBurnerXP is trying to tell me exactly. I did notice that after having iTunes open randomly one day (the disc has been in my drive for over a week due to distractions), when I closed iTunes, the disc tray would pop out... I don't know why. Did iTunes mess up the CD somehow? EDIT: I pasted the image twice on accident and now I can't delete the 2nd one, so it's just a duplicate.